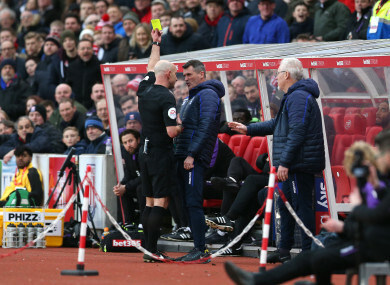 Keane is shown a yellow card by referee Roger East. NOTTINGHAM FOREST’S PROMOTION hopes took a hit on Saturday as they lost 2-0 away to Stoke City. Roy Keane, who has joined his former club as Martin O’Neill’s right-hand man after they worked together in the Ireland job for five years, was pretty animated on the touchline during the second half and received a yellow card from referee Roger East. Referring to the incident, O’Neill revealed that he is putting a code of conduct in place for the squad before going on to joke that the players would be doing well to fine the former Manchester United captain. “Of course,” O’Neill replied, speaking to the Nottingham Post about Keane’s passion. “I think that it’s one of the things I have got him along for. “He was a driven person as a player and he is also a driven person as a manager and now in this particular role it is pleasing to see – but I will find out what he said. “We have a new code of conduct coming in now, for us, internally. It is something we look at. So if the players want to fine Roy, good luck to them. First of all I will need to find out what it was. I myself had an occasional run-in with a particular linesman down here. We had a total disagreement at what constituted a foul. “I am not exactly sure what Roy’s situation was. But I do know about my own situation. “I just spoke to the linesman after a very, very obvious foul and he waved to play on, because he did not think it was a foul. I just felt that we were in real difficulty if he did not think it was. Forest sit four points outside the play-off places with one game more played than the three clubs — Birmingham City, Derby County and Bristol City — sitting directly ahead of them. Email “O'Neill wishes Forest players 'good luck' attempting to fine Keane after booking”. Feedback on “O'Neill wishes Forest players 'good luck' attempting to fine Keane after booking”.